Three policemen have been killed by gunmen who attacked a zoo in Nigeria's mid-western Edo State, the police have told the BBC. 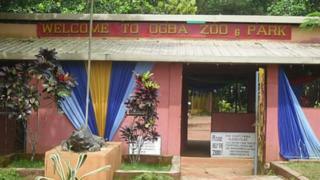 The gunmen also abducted the head of the zoo, after they stormed the 750-acre Ogba Zoo and Nature Park. The information minister has condemned the attack, describing it as a big blow to efforts to promote tourism. According to a police spokesman, Sunday's incident occurred in the presence of more than 200 visitors. There is no information on who the gunmen and abductors are, or whether they have made any demands. Information and Culture Minister Lai Mohammed described the zoo as one of Nigeria's top tourist destinations. He called on the abductors of zoo director Andy Ehanire to quickly release him unharmed. Mr Mohammed said that security at all tourist sites across the country would be stepped up.